Leading monthly men's magazine Popular Mechanics has commissioned Netcong Auto Restorations, LLC., to make over a 2010 Chevrolet Camaro SS for the magazine's annual Car Makeover feature, running in its May and June issues. Popular Mechanics staff conducted a nationwide search of hundreds of automotive restoration shops before selecting Netcong Auto Restorations to complete the project. 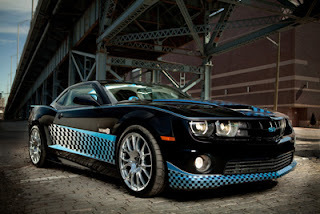 The goal of the 2010 Popular Mechanics Car Makeover is to build a super high-performance Camaro, with custom designed exterior body and creative paintwork, and a wide range of advanced electronic/computer technologies integrated into the interior, to make this a "must-own vehicle." The 2010 Camaro Makeover Project will include custom paint, custom rear spoiler, custom rear tailights, headlights and grill, custom hood scoop for supercharger induction, custom functional rear quarter panel vent gills, LED lighting, highe perfromance wheels and tires. INTERIOR MODIFICATIONS:Interior and upholstery modifications include custom seating and inetrior trim, custom LED lighting throughout, custom header, custom rear center console (houses printer), custom trunk (aftermarket amps, speakers, subwoofer enclosures).